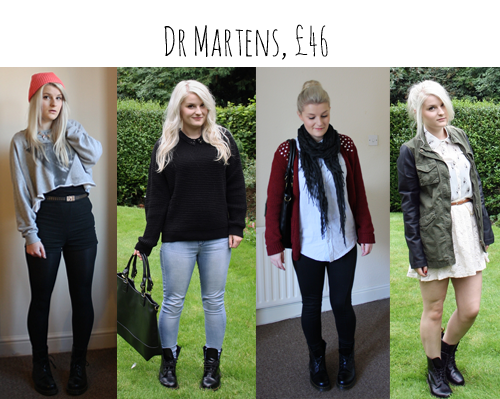 I'm all over these compilations of 2012 outfits popping up on my Blogger feed and I'd love to make my own, but I feel like I've not been in the fashion blogging game for long enough to make a decent one. It'd be more of a May to December of outfits! My blog actually started its little internet life at the end of January of 2012 as a beauty blog and gradually began featuring the occasional fashion / style posts around April; this has resulted in my posts from the last 6 months documenting my outfits best. So, I've decided it'd be better for me to share my 3 best buys / most worn of 2012 - although, in reality it's just my 3 best buys / most worn for AW12 because of the lack of outfit posts in my earlier blogging antics. So here they are. The three gems that have been my best friends through rain, mud and more rain (with an umbrella to hand) over the past few months! Also, for the number of times I've worn them in the relatively short time I've owned them, I've already got a ridiculous amount of wear out of them all. I cannot express my love for this coat enough. I feel like a cat in it, and that's enough to make me want to wear it every waking minute of the day. In all honesty, I've worn it pretty much every other day over my outfits since purchasing it a couple of months ago. It's so versatile and most importantly super-duper warm. I had a 20% off code for Boohoo when I got this so I paid £28 instead of £35. It's no longer sold on Boohoo, but I actually spotted (what I believe to be) exactly the same black faux fur coat on PrettyLittleThing.com for just £25 in the sale, there's only a size 12 though. So if you're interested in snapping this up too, you can now get it at an even more affordable price (if you just so happen to be a size 12)! Part of the reason I adore this jacket so much is probably mostly because it's from the teens range in New Look. I'm mad about the kids bits in high street shops - I'm around a size 10 and can usually fit in an age 14-15. I know, pretty much everyone and their vicar has one, but it's the only khaki thing I own (I think) so I'm allowed to love it. 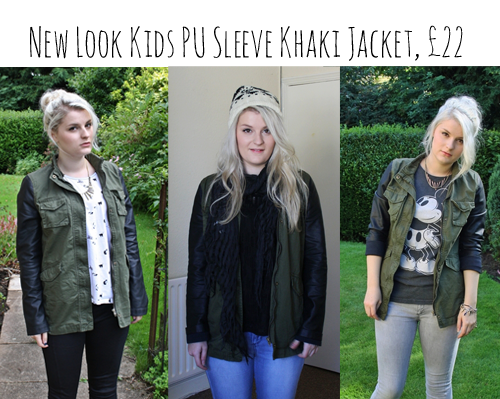 You still get student discount on the teens clothes at New Look too, bonus. If I had to pick and one of these three as my BEST best buy, it'd be my Docs. Although they were utter hell for the first 2 months (mine were near impossible to wear in), they're now my most worn shoes. And yes, I did buy these in the summer - boots are all-year-round footwear for me! These were super cheap (... for Docs!) as I had a 20% off voucher for Amazon and I'm hoping they'll last me years! Well, I guess this post has kind of shown my outfits over the months as well as my best buys of (what has been on my blog) in 2012! Did you buy any clothes, shoes or accessories this year that you've been mad about? I really like each of these, that New Look jacket is awesome and I really want some Docs! Can't afford them at the moment but maybe some time in the future. I'd say my most worn things this year were all of my Converse (can't have enough Chucks!) and some amazing boots from ASOS. Oh! And some leather pants from River Island, can't get enough of them. I was lucky to get mine while that Amazon offer was on! Ohh I love converse, they're so versatile! I am dying for some leather trousers! Happy new year Demi :)! 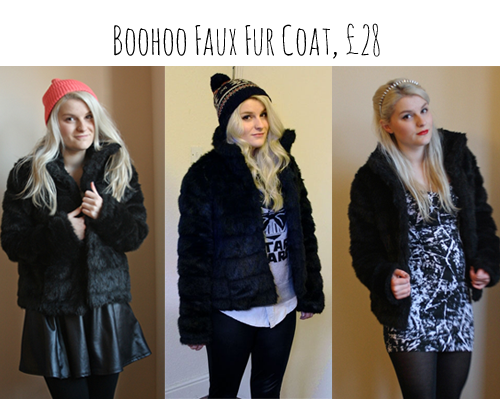 Hi you look really nice in all of the pictures, the Boohoo faux fur coat seem really snugly (sic) and warm. Lets be honest Doc Martin can be worn for all most any occasion really. I think this is the first year i hasn't gone mad and brought loads of new clothes, my weight been up and down this year so lots of baggy clothes and hiding my figure, now I'm losing weight i can start buying clothes again. x Happy New year to you. nice way to do a best of post. Your new look jacket definitely had me very jealous. happy new year! Thanks Lola :) Happy new year! Yeah I wear mine lots too! Docs would look great with the jacket hah ;)! Ah I love this post, such a great idea! I'm dying to get a jacket like that second one! I love all three of these! I recently got a pair of docs and i love them already, i managed to get mine for £30 from a doc martin shop in northamptonshire, such a bargain.